One of the highlights of my tenure as editor of ATT was the opportunity to meet Al Nagler. In an industry boasts more than its share of larger-than-life innovators, I can think of none who’ve had greater influence. Introducing our new astro-tech publication at NEAF, the world’s largest astro-tech expo, could easily have been a nerve-racking experience, but Al was so gracious in taking the time to visit with me – so welcoming – all anxiety melted away. Instead, there I was, a rookie editor of an unproven, startup magazine, engaged in a long, friendly, illuminating chat with Al Nagler. For newbie editors, it didn’t get much better than that! Still doesn’t. It wasn’t until years later – long after my initial fan-boy giddiness had calmed – that I realized what resonated most clearly upon meeting Al for the first time: generosity, kindness and honesty. In other words, he was not only a legendary astro-tech innovator, he was a gentleman. When, several issues into our first year, Al told us how much he enjoyed the magazine, that was as close to the Good Housekeeping seal of approval as we could get. I suppose Al’s innovative approach to product design represented the natural progression of his professional experiences from 1957 to 1973, working as a senior optical-systems designer for the Farrand Optical Company, which developed visual simulators for several NASA programs. Included in Al’s responsibilities were the one-off displays for the Gemini and Apollo Lunar Module spacecraft. The visual simulators used large mirrors to project images of Earth orbit, docking and lunar landing. The lunar landing was simulated by a complex optical probe, a TV camera and lens that “flew” down onto a scale model of the lunar surface. Al’s unique experiences in developing these and other space-exploration technologies provided the technical foundation for all that followed, including the Renaissance Telescope (see Image 1), his patented wide-angle eyepieces and other optical systems that have been introduced by Tele Vue since Al created the company in 1977. To evidence just how thoroughly Tele Vue’s innovations are respected, its products have been represented in an amazing 16 of 19 Hot Products lists, since Sky &Telescope introduced that must-read annual feature in 1998. 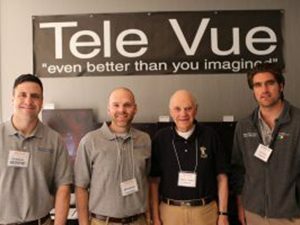 As the following list reveals, not only have Tele Vue products been honored in 16 S&T Hot Products lists, in some years the list included multiple Tele Vue products. – January 2015: BIG Paracorr. – January 2014: NP127fli Astrograph. – January 2013: Delos Eyepiece Line. – January 2012: Delos 6mm and Delos 10-mm. – January 2011: Ethos-SX 3.7-mm and Paracorr Type-2. – January 2009: Ethos Eyepiece Line. -January 2008: Ethos 13-mm 100°. – January 2007: “IS” Apo astrograph refractors and Paracorr for SBIG STL-series. – January 2006: DIOPTRX astigmatism correctors. – January 2004: TV-60 Apo refractor, 2- to 4-mm Nagler Zoom and 41-mm Panoptic eyepieces. – January 2003: 24mm Panoptic eyepiece. – December 2001: 3- to 6-mm Nagler Zoom and NP101 Apo refractor. – December 2000: 102 Apo refractor. – December 1999: 31-mm Nagler Type 5 and Radian-series eyepieces. – December 1998: 5x Powermate. This year celebrates 40 years of Al’s pioneering optical designs with Tele Vue. Those years have inspired numerous articles that have chronicled Al’s life and innovations, and the revolutionary nature of Tele Vue’s product lines. It’s a cornucopia of insight that the Internet is kind enough to share. So, instead of my retelling a story that has been told so well through so many different voices, we will simply direct you to some of what we consider the best (or most interesting!) that are publicly available. Company7’s Mark Cohen published an extensive article covering much of Tele Vue’s history on the Company 7 website. It provides a comprehensive narrative of the early days of Tele Vue, including images of original early drawings of the “Nagler” eyepiece design. You’ll find the article here: http://www.company7.com/televue/telal.html . Mike Smith with Australia’s Bintel (The Binocular and Telescope Shop) published this biography in the company’s monthly magazine. It provides nice insight into Al’s early experiences and how that period shaped his future astronomy endeavors. 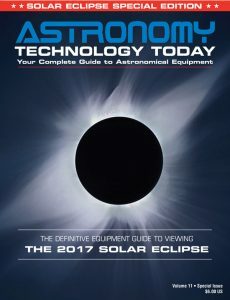 You can read the article here: http://www.televue.com/pdf/TV_Handout_NightSkyBioOnAlNagler.pdf . Michael Bakich, Astronomy Magazine’s Senior Editor, wrote an extensive biography featuring Al Nagler in the April 2013 issue of Astronomy Magazine. The article shares compelling insight into Al’s life and his journey to becoming such a legendary figure in our industry. We particularly enjoyed the extensive photos, which help chronicle and illustrate the life stories of Al and his wife Judi. You can view the article at: http://www.televue.com/Pdf/Astronomy_LifeOfAlNagler_2013APR.pdf . In 2009, Clayton L. Jeter did a wide-ranging Q&A with Al for the Houston Astronomical Society’s GuideStar newsletter. It’s an especially engaging interview, given its enthusiast’s point of view. You can read the article here: https://www.astronomyhouston.org/sites/default/files/guidestar/2009_05_GuideStar.pdf . On the Cloudy Nights forum, “Ron Bee” wrote a rambling post about a day in 2005, when he got to meet Al at Tele Vue’s display during OPT’s annual telescope show. After stopping by to say hi, Al invited him to spend the day at the booth. It offers a unique glimpse into the graciousness Al extends to all who share his enthusiasm for amateur astronomy. You can read the post here: http://www.cloudynights.com/page/articles/cat/articles/special-events/my-day-with-al-nagler-r1149 . In 2004, Cloudy Nights editor Tom Trusock took a deep dive into the entire Nagler eyepiece line. One especially interesting aspect of the article is Tom;s “Nagler Myths Dispelled” section. You can read the article at: http://www.cloudynights.com/documents/naglers.pdf . “Uncle” Rod Mollise shared his experiences with Al (as only he can do!). One of the highlights of this article is Rod’s summary of the eyepiece choices he experienced from the beginning of his observing days in 1965 to Al’s introduction of his now-legendary eyepieces. You can read the article here: http://uncle-rods.blogspot.com/2012/10/uncle-rod-and-uncle-al.html . Sky & Telescope senior editor Dennis di Cicco conducted a video interview with Al, which provides an overview of the company’s history and how some of its ground-breaking eyepieces and telescopes came to be. You can view the video here: http://www.televue.com/engine/TV3b_page.asp?id=13&Tab=_NEAF2014 . Included here is a timeline of the product releases by Tele Vue over the last 40 years. The depth and breadth of transformative innovation included there is … well, it’s unprecedented. Congratulations to the entire Tele Vue team on an amazing ride! We look forward to enjoying the equally revolutionary innovations Tele Vue will, undoubtedly, introduce in the future! 1977 – Television Projection Lens 343-mm, f/2.6. 1978 – Television Projection Lens 279-mm, f/1.8. 1979 – Al Nagler begins design on telescopes and eyepieces for fellow amateur astronomers. 1980 – 55-, 26-, 17-, 10.4- and 7.4-mm Plössls ; 13-, 9- and 4.8-mm Naglers; 1.25-inch 2.5x Barlow. 1981 – MPT: 5-inch, 500-mm, f/4; 40-, 21- and 13-mm Plössls; 2-inch solid-aluminum machined mirror diagonal. 1982 – 2-mm Plössl; 40-, 32-, 24- and 19-mm Wide Fields. 1984 – 550-mm, f/5.5 Renaissance ; 15-mm Wide Field; 7- and 11-mm Naglers. 1985 – 1.25-inch 1.8x Barlow. 1986 – 20-, 16- and 12-mm Nagler Type 2. 1987 – 560-mm, f/7.4 Oracle. 1988 – 500-mm f/5.0 Genesis. 1989 – 2-inch 2x Big Barlow; Paracorr. 1991 – Solaris Solar Telescope; 450-mm, f/6.4 Pronto; Starbeam Unit-Power Finder. 1992 – 480-mm, f/6.8 Pronto; 22- and 35-mm Panoptics. 1993 – 540mm, f/5.4 Genesis-sdf, Renaissance-sdf. 1994 – 15- and 27-mm Panoptics. 1995 – 480-mm, f/6.8 Ranger, 25-, 20-, 15-, 11- and 8-mm; 1.25-inch 2x and 3x Barlows; Bino Vue. 1996 – 540-mm, f/5.4 TV-101, Renaissance-101; 700-mm, f/5.0 TV-140; 19-mm Panoptic. 1998 – 600-mm, f/7 TV-85; 600-mm, f/7 Bizarro-85; 2.5x and 5x 1.25-inch Powermates; 22-, 17- and 12-mm Nagler Type 4; 18-, 14-, 12-, 10-, 8-, 6-, 5-, 4- and 3-mm Radians; 2x Bino Vue Amplifier/Corrector. 1999 – 2.0-inch 4x Powermate; 31-mm Nagler Type 5; 0.8x Reducer; 99-percent reflectivity Everbrite diagonal. 2000 – 880-mm f/8.6 TV-102, Renaissance-102; Visual Paracorr. 2001 – 540-mm f/5.4 NP-101; 480-mm f/6.3 TV-76; 16-mm Nagler Type 5; 13-, 9-, 7- and 5-mm Nagler Type 6; 3-6 Zoom Nagler; Sol-Searcher (Sun Finder); Universal Finder Mount; 90-degree flip-mirror Starbeam. 2002 – TV-102i for Bino-Vue; 26-mm Nagler Type 5; 24-mm Panoptic;2.0-inch 2x Powermate; 60-degree Everbrite diagonal. 2003 – 660-mm f/5.2 NP-127; 360-mm f/6.0 TV-60; 20-mm Nagler Type 5; 11-, 3.5- and 2.5-mm Nagler Type 6; 41-mm Panoptic; 2- to 4-mm Nagler Zoom; Mars Filters; BirdScope.com established; Focus Lever; Bandmate OIII Filter; Bandmate NebuStar Filter. 2004 – X-Y Adjustable Mount; Quick Release Universal Finder Mount. 2005 – 360-mm, f/6 TV60is imaging system; DIOPTRX Astigmatism Correctors; Click-Stop 8- to 24-mm Zoom for DIOPTRX; Focusmate Eyeguard extender. 2007 – 13-mm Ethos 100° eyepiece; Universal Paracorr for imaging with Newtonians; Focusmaster Auto-focus electronics for Focusmate driver. 2008 – 6-, 8- and 17-mm 100°-Ethos. 2009 – 10- and 21-mm 100° Ethos; 1.5x Extender for NP101is/NP127is Imaging Systems. 2010 – 3.7-mm SX 110° Ethos; Paracorr Type-2. 2011 – 6- and 10-mm 72° Delos; 4.7-mm SX 110°Ethos. 2012 – 17.3-, 14-, 12-, 8-, 4.5- and 3.5-mm 72°Delos. 2014 – 680-mm, f/5.3NP-127fli Astrograph; BIG Paracorr. 2015 – 18.2-, 11- and 7-mm DeLite; Gibraltar HD4 and HD5 Mount; FoneMate adapter. 2016 – 15-, 9- and 5-mm DeLite.